To some, Larry Gonick is a cartoon genius in all senses of the phrase; for others, he's more like a cartoon madman. 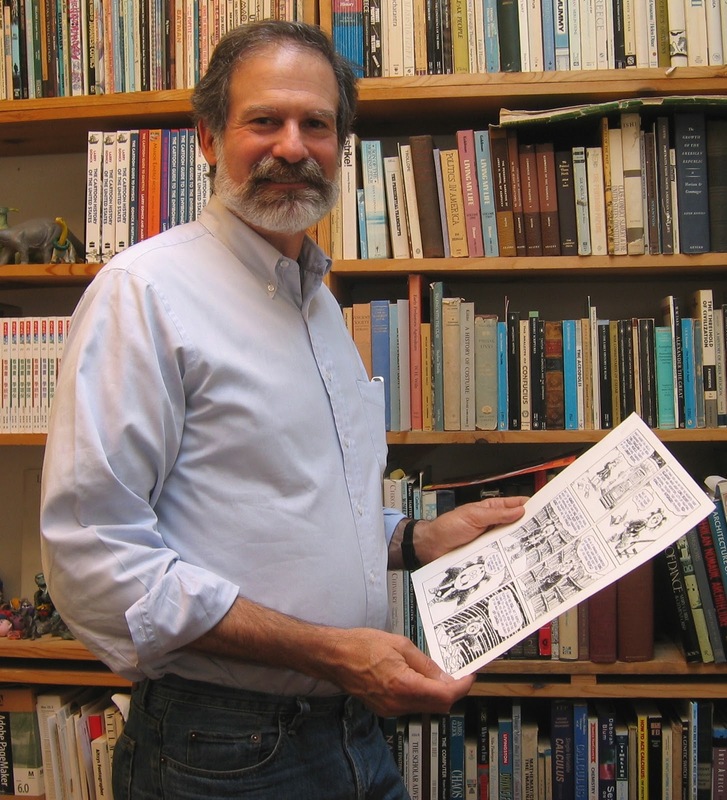 In 2009, Gonick published his fifth volume in the Cartoon History series, thereby spending some 1400+ pages depicting the history of humanity in comics. He has been kind enough to grant me an interview for this blog. LANCE EATON: You spent some 30+ years composing the Cartoon History series? How does it feel to be “done” with it? Are you done with it? LARRY GONICK: Yes, I'm done with it. When I finished, I felt great! Proud! Master-of-the-Universe Powerful! Then a few months went by, and I began to feel as if the organizing principle of my life had disappeared. Vacuum at the center. I kept asking myself, "if this was a lifetime project, is my life over?" Then those feelings faded. Now I just get up in the morning and go to work. I still do feel happy to have finished what I started, though. EATON: What were the most challenges elements of composing the Cartoon History series? What sections/chapters/events might you re-evaluate or re-do if given the chance? GONICK: You ask short questions with long answers! Right now the most important revision would be to the human evolution section, Book 1, Volume 2. So much more is known now than when I wrote it, especially the details (gathered from DNA evidence) about the earliest migrations of homo sapiens out of Africa. Another issue, and would be an expansion, not a re-do, is to explore more fully the "peripheral" regions of the world. Sweden, Korea, etc. When the Korean translation came out, every email I had from Korean readers complained about the lack of Korean history. At first I tried to explain that my idea of world history didn't mean the history of everywhere in the world, but rather a large story that was mainly about interactions, and peripheral places didn't have as many interactions. Since no one seemed receptive to hearing this, I quit bothering. As it is, I could have and should have added more in the very last installment about several places, which are now more thoroughly integrated into a globalized world. Another one would be to re-ink Book 1, Vol 7, with a brush, rather than a pen. All the rest of the series was done w/ a brush. EATON: What kind of issues around production/publishing in terms of content/censorship, book-length, and other behind the scene concerns did you run up against? GONICK: None. The length and structure were self-imposed. I wanted the discipline to make sure I finished. 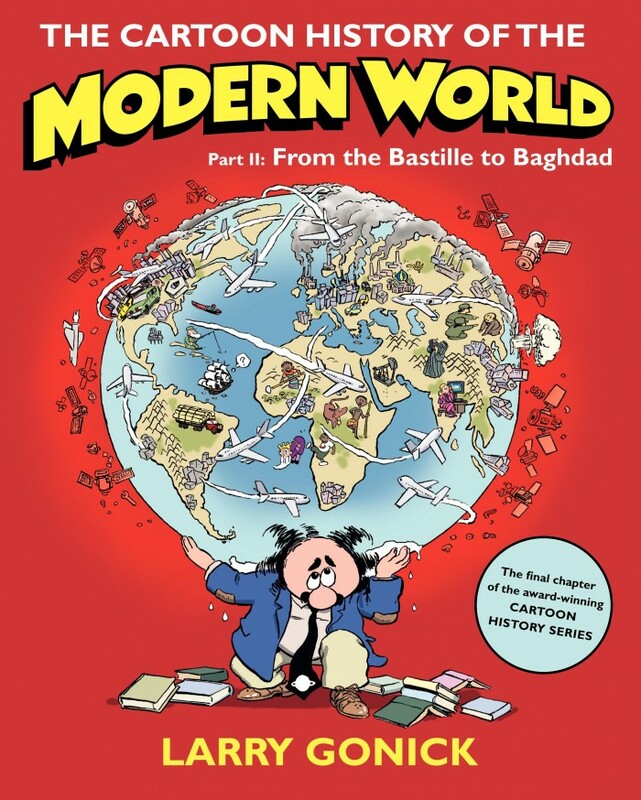 As I say, I could have used about 35-50 more pages in Modern World Part 2. EATON: What are your own critiques of your work? GONICK: By and large, I like the writing better than the drawing. Just putting together all the information was so time-consuming that I always felt I didn't have as much time for the art as I would have liked. This problem felt less acute as I went on, especially in the last two books, when I had established something like a regular "visual vocabulary" on which I could draw, but I felt it acutely in the first two—except for the dinosaurs, which I drew lovingly. I think I've always liked dinosaurs better than people. Is that a critique? EATON: Besides the dinosaurs (and finishing), what did you find most rewarding about doing the Cartoon History series? GONICK: They stay in print!!!!! EATON: One of the things I’ve always enjoyed about your books is that they had a good blending of historical theory, criticism of the history discipline, and humor to produce a series of books that don’t just provide a straightforward history provide a meaningful approach to thinking and learning about history. Can you speak to this at all? GONICK: As Ike Turner once said (in "It's Gonna Work Out Fine"), That was my plan from the very beginning. Voiceover a fairly straightforward narrative. Commentary from people "on the ground." A certain amount of historiography (i.e., poking fun at historians), mostly in the footnotes. The footnotes, by the way, are the main vehicle for explicit commentary in the authorial voice. The idea came to me from a book my father picked up from a used bookstall in San Francisco when I was in high school. The book, called "Almanac for 39ers," was a well-produced guidebook/calendar for the 1939 World's Fair. It had historical items listed day by day, but also included independent footnotes on various topics, and these were fun. I first used footnotes in a Sunday comic strip, coincidentally titled "Yankee Almanack," a history of colonial Massachusetts I did for the Boston Globe. As you probably know, Sunday strips have to have a flexible format, with some independent panels that can be discarded to convert a half-page to a one-third-page. There's a standard way to do this, but it didn't work for me; the footnotes, though, had the same effect. 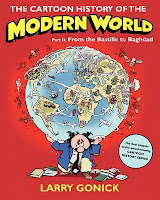 EATON: What have you found most surprisingly about the reception of your comic guides and A Cartoon History of the Universe/Modern World series the most? GONICK: Surprising? I don't know... For some reason, I have a big following in Indonesia. That's a puzzle. Otherwise... frankly... I've always wondered a little why the series doesn't sell about 10 times what it has, but at least it all stays in print, so I can't complain. EATON: What kind of discussions have you had with historians about your work? GONICK: Almost none at all, strangely enough. Sometimes I wonder if historians don't take their subject too seriously. I've had far more interaction with scientists. EATON: In talking of the series popularity, what was your reaction when you discovered it being used on college campuses? GONICK: Relief that professors and students were "getting it." The main thing, from my point of view, about classroom use is that I know that the stuff works. I operate pretty much in isolation, writing the comics to suit myself. The fact that teachers actually find them useful is extremely gratifying. It also absolves me from any whiff of the implication that these are some kind of Cliff's Notes, easy summaries. I like to think there's enough originality, effective story-telling, and interpretation to make the Cartoon Histories stand on their own. EATON: Is there a “Comic Guide” that you wouldn’t write but would like to see out there? GONICK: That I *wouldn't* write? I hope to write the ones that I would like to see out there! EATON: Do you feel the field of nonfiction/informational comics has changed since you first started? If so, how? GONICK: Now it exists. Before, it was pretty much confined to "industrials." At least in the United States. The pioneer non-fiction humorist/cartoonist was Rius in Mexico. I started after seeing his work. EATON: Can we expect an “omnibus edition” Cartoon History of the Universe with all 1450 or so pages? GONICK: Probably not, at least not soon. There have been three different publishers, for complicated reason, so we'd have to find someone willing to do a three-way or four-way negotiation to make it happen. EATON: So you’ve covered the history of the world, what’s your next project? Comic or otherwise? GONICK: I'm finishing up The Cartoon Guide to Calculus. After that, I hope to do at least one more math book. There's a novel percolating in the back of my brain. And (hint, hint) if there's anyone out there who wants to animate the Cartoon History of the Universe, LET'S TALK! 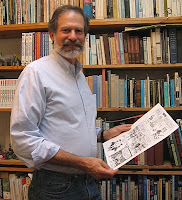 For more information and updates on Larry Gonick, check out his website!